Purdue picked up an historic win on the road at Penn State, winning in Happy Valley for the first time since 1982 and topping the Nittany Lions for the first time since 2010. Illinois also scored an important road win, besting Nebraska in four sets in Lincoln. Minnesota, Wisconsin and Indiana also picked up road victories. 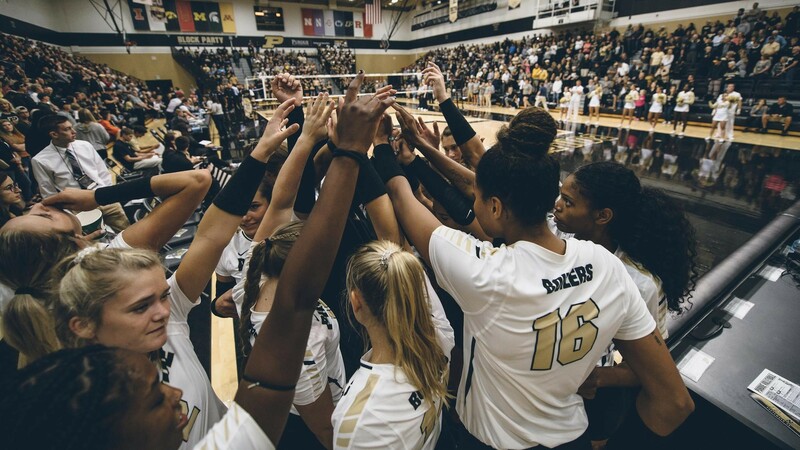 Purdue snapped a 13-match losing skid against Penn State, rallying from down 20-13 to steal away Set 3 and continuing on to victory after trailing 2-0 in the match. The win marked just the Boilermakers second over PSU since 1987 (also Oct. 8, 2010 in West Lafayette), a string of 54 matches (53-1). Penn State boasted the advantage in every statistical category: hitting efficiency (.257 to .233), kills (69-68), aces (5-2) and blocks (11-9). The Boilermakers started slow hitting -.069 in Set 1, but hit .250 or better the rest of the way, including a .321 effort in Set 5 (to PSU’s .182). Sherridan Atkinson posted a career-high 32 kills, while hitting .518 and adding three blocks to pace Purdue. Atkinson notched her 1,000th career kill and became the first Purdue player since 2014 to surpass the 30 kill plateau. Caitlin Newton followed with 15 kills and Blake Mohler added nine. Taylor Leath was tops for the Nittany Lions with 21 kills and 12 digs, while hitting .333. Nia Reed notched 18 kills, while Kaitlyn Hord added 10 putaways and hit .421. Purdue rallied from down 20-13 in Set 3 and down 18-15 in Set 4. Penn State boasted an 8-5 advantage at the changeover in Set 5 and carried on to a 12-9 lead. Atkinson downed two kills and PSU contributed two hitting errors amidst a 5-1 run that saw Purdue earn the first match-point try at 14-13. Neither side would concede, combining for four more attempts. Down 18-17, Purdue got kills from Marissa Hornung and Atkinson before a hitting error by Jonni Parker gave the Boilermakers the historic victory. The Illini picked up their first win over Nebraska since 2014, while earning their fifth straight win of 2018 and notching their 20th victory. Illinois held Nebraska to just a .099 hitting effort, marking just the second time the Huskers have hit below .100 on the season (also an .087 effort at Wisconsin, 10/19). Illinois had help from 30 Nebraska hitting errors, while outdoing the Huskers 61-50 in kills and hitting .187. Nebraska won the serve 8-5 in aces, while both teams put up 12 blocks. Jacqueline Quade turned in a 23-kill, 13-dig double-double to pace Illinois, while Ali Bastianelli added 10 kills and five blocks. Ashlyn Fleming chipped in nine kills and six blocks, while hitting at a team-best .364 clip. Mikaela Foecke (17 kills, 14 digs) and Lexi Sun (15 kills, 20 digs) led the Huskers, while Lauren Stivrins added nine kills and five blocks at a team-best .292 clip. Illinois overcame an 8-3 deficit in Set 4, using a 7-0 midset run to go up 14-11 The Illini held on despite Nebraska ties at 18, 19 and 22. Illinois ended the match on a 3-0 run, including a service error and two Fleming blocks. Wisconsin picked up its fourth straight win with the sweep, while MSU dropped its fifth straight match. The Haggerty sisters faced off for the only time in the collegiate careers with MSU senior Maddie notching seven kills and six digs, while Wisconsin sophomore Molly posted five kills and eight digs. Wisconsin outhit Michigan State .319 to .146. Dana Rettke and Grace Loberg turned in 11 kills apiece for Wisconsin, each hitting .346 or better. Rettke also put up a team-high four blocks and two aces. Four players posted five or more kills for the Spartans, led by Alyssa Chronowski and Molly Johnson, who downed eight apiece. The teams were tied at 18 in Set 3 before Wisconsin pulled away with a 4-1 run en route to the victory. Minnesota outhit Michigan .364 to .150 helped by a 14-0 advantage in blocks. The Wolverines outserved the Gophers 3-1 in aces. Michigan ran a 6-2 offense for the first time in 2018 as starting setter MacKenzi Walsh did not play. Walsh turned in a 49-assist, 15 dig effort vs. Wisconsin on Friday. On Saturday, Maddy Abbott and Katerina Rocafort split the setting duties. Four Minnesota players posted double-digit kill efforts: Taylor Morgan (13), Alexis Hart (12), Stephanie Samedy (10) and Regan Pittman (10), with each hitting .345 or better. Morgan hit .632 and put up five blocks, while Pittman turned in a .500 effort and eight stuffs. Paige Jones notched 18 kills and nine digs for Michigan, while hitting .349. Carly Skjodt was held to just eight kills and a .108 hitting effort. Michigan rallied from down 15-6 in Set 3 to cut the margin to four at 21-17, but could not complete the comeback bid. Indiana piled up 16.5 blocks in the victory (to 10.5) and outhit the Scarlet Knights .220 to .114. The Hoosiers also boasted a 49-47 lead in kills and 8-6 edge in aces. Breana Edwards and Lexi Johnson put down 10 kills apiece to lead IU, while Kamryn Malloy added nine kills, 12 digs, five blocks and six aces. Victoria Brisack posted a 20-assist, 10-dig double-double. Tali Marmen led all hitters with 17 kills on a .244 hitting effort to go with nine digs for Rutgers. Inna Balyko turned in a 38-assist, 17-dig effort and five blocks, while Merle Weidt put up eight blocks. Indiana opened Set 4 on a 13-0 run and soon led 17-2. Five Rutgers miscues and four kills and two block by Edwards highlighted the stretch. Edwards also downed the final kill of the night at 25-12.